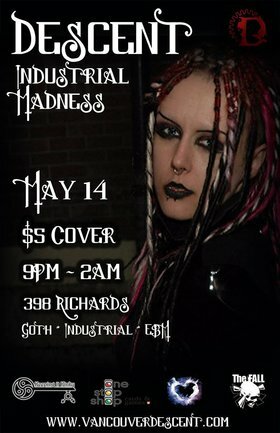 Goth and Industrial go together like Jack and Coke and you can get your fill of all four on May 14th as the Descent crew brings you a night of Industrial Madness. An aggressive fusion of rock and electronic, Industrial breaks all the rules of music, and we know how you feel about rules. From the early pioneers that infused the sounds of mechanical and electrical machinery with synthesizers and samplers to the modern bands of a thriving scene,join us for an evening of dirty, sweaty, dark and hard music that will put the stomp in your boots! Descent Sundays boasts an exclusively nonexistent dress code. "Why?" you ask. Well, it's simple: We want everyone who comes to our events to be comfortable. New people entering the scene, or just checking it out, may not have figured out their style. So you may be wondering what is acceptable. Jeans and a t-shirt? No problem. Full out Goth? Totally AWESOME. Punk kid? Rock god? Sk8tr girl? Great! Sweet! Wicked! Feel like going all out in some jaw dropping ensemble? You're totally welcome to. Come how you want to but we are strongly encouraging everyone to dress up in their favourite Gothic style.